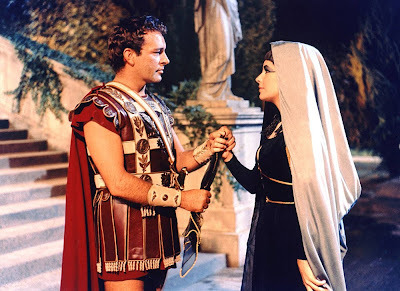 To understand the scale of the budgetary and box-office double-whammy that did for Joseph L Mankiewicz's elephantine 1963 version of Cleopatra, it's worth noting that of the 50 most expensive movies ever made, adjusted for inflation, Cleopatra is the only one on the list that was released before 1998 – and at no 15, it's still a major contender. The budget was around $44m ($320m in today's money), the kind of outlay that might have helped Nasa put a man on the moon by 1966. The weird thing was that, even on this unprecedented scale of loss, Cleopatra, hampered by its lengthy and event-filled gestation process – which included Elizabeth Taylor's near-fatal illness and the film's subsequent relocation to Rome's gigantic Cinecitta Studios – and by the publicity attending the scandalous affair between Taylor and Richard Burton (both then married to other people), still managed also to be the biggest US movie hit of 1963. Even so, it was a financial disaster for 20th Century Fox. It also more or less killed off the big-budget period epic for ever, just as The Greatest Story Ever Told killed off the biblical epic in 1965, and Heaven's Gate would finally kill off the long-moribund classic studio western in 1980. Flops on this scale are like suicides, they take everyone else down with them. So what did Cleopatra give us in return? A bloated and tedious, neverending yawner that flashes briefly to life in a couple of spectacle sequences – the battle of Actium and Cleo's entry into Rome – and some stretches of pungently witty dialogue, especially when Rex Harrison's Caesar is still around. That's what Mankiewicz was good at – talk – so how he ended up on the bridge as this ship went down can only be accounted for by that special hidebound, gerontocratic mindset that still governed the 1960s studios. What do I think of this recent article? Regardless of what I think of CLEOPATRA I'm glad this exists. The PEPLUM genre needs massive introspection of itself in order to be revived fully and make sure no one makes the same mistakes. I agree with him that it's a bloated and tedious affair (the same words I've used for my IMDb critique of this film) but I disagree that only CLEOPATRA killed the genre. The failure of THE FALL OF THE ROMAN EMPIRE was also a big factor in the demise of the epics. Suffice it to say I enjoy reading these new articles in the mainstream media. I would think THE FALL OF THE ROMAN EMPIRE was in production when CLEOPATRA was having its first run. It seemed a bit boring compared to the excesses of CLEO and it was not that successful at the time. The two of them more or less killed off the big epic, and yes THE GREATEST STORY EVER TOLD was more of the same in 1965. Thing is they all look good now seeing them on widescreen HD televisions, we won't see their like again as everything now is diminished by CGI effects (TROY, KINGDOM OF HEAVEN etc).